Gardening (as it does every summer) has taken the front seat here at chezTECH. As a consequence, knitting has no power over me just now, and the blog is on vacation. However...someone asked a question on Ravelry recently which caught my eye--a question about making curly I-cord. As it happens, one method for making this recently revealed itself to me. So, taking time from the garden here's a little mid-summer post on one way of making I-cord curly (for glasses-cords, necklaces, edging and the like). Curly I-cord "in the wool"
Step 1: Make a length of LOOSELY knit I-cord. If you are knitting the cord by hand, use needles larger than normal for that weight yarn. If making the cord on a mill, where the needle size cannot be changed, use thinner yarn than normal to get the loose cord required for this trick. Also, The I-cord must be at least 4 stitches, a three stitch one won't work very well. Step 2: To make the cord curly, the basic trick is very similar to the crochet hook method for tightening a ladder in of loose stitches in decreases or a column of loose stitches knit stitches in ribbing. Specifically: pick a "ladder" between two columns of stitches as the one to operate on. If you should happen to have a ladder caused by the "gap around the back"" (such as sometimes happens when making I-cord by hand) choose that ladder. 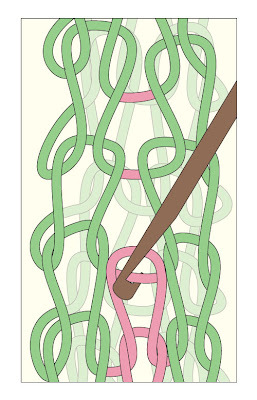 In the below illustration, a four-stitch I-cord is being curled up, the ladder being operated upon is shown in pink. Step 3: Inserting a crochet hook into the pink ladder between two stitches, draw the next rung of the ladder through the first. Continue in this manner until you reach the top. In the below illustration, the original four-stitch I-cord is in the process of getting a fifth column added: its two pink stitches have already latched up out of the pink ladder. As you latch up the ladder, the I-cord will curl up because the new pink column you're hooked up is MUCH MUCH tighter and therefore MUCH MUCH shorter than the other four columns. Being shortest, it forces the other, longer columns to spiral around it, and voila: curly I-cord. Of course, the entire cord gets shorter, so make the original (uncurled) cord longer than you need, to account for this. Another tip: If you like, you can bead the cord by using a very small crochet hook, small enough to fit a bead upon. As illustrated below, insert the bead over the hook, then draw up the next stitch in the ladder. Once that stitch is drawn up as shown, you can slide the bead off the crochet hook onto the stitch. The following stitch would be drawn up the usual way. The below illustration shows one bead slipped onto every third stitch (ie: every third row). You have been reading "I cord with a curl" on TECHknitting blog.